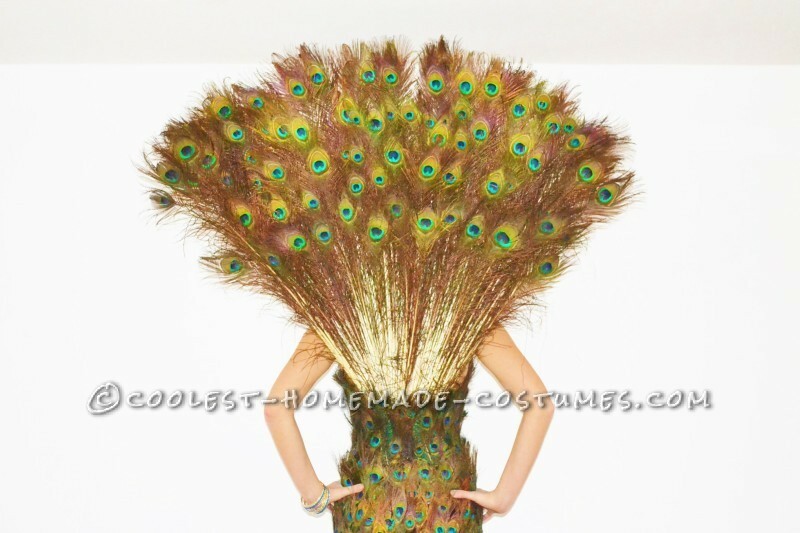 Head-Turning Peacock Costume - 100% Homemade! 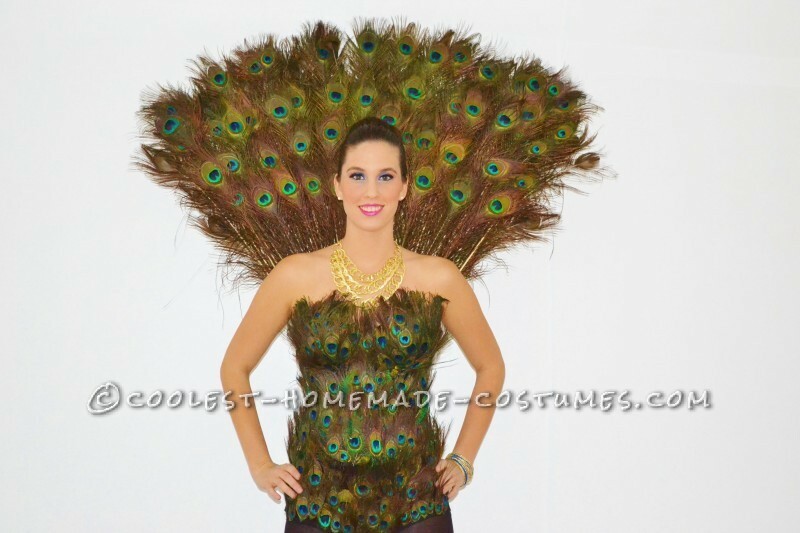 Amazing Peacock Costume – Entirely Homemade! I decided to go for a peacock costume idea this year for Halloween. I was inspired by Linda’s costume on this website. Her peacock costume looked so amazing and I had to give it a try. 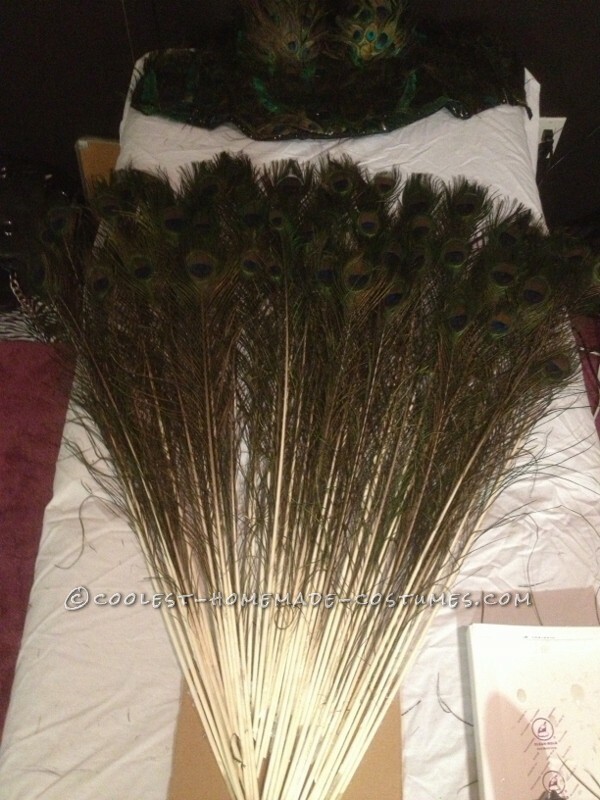 I bought the peacock feathers on eBay over the course of a year. Yes, I know, sounds crazy but I knew I would need a lot. I had a small budget to work with. I had a limit I would bid per feather and once it went over that amount I bid on other feathers. There are an abundance of peacock feathers in China! I took a few trips in that time to that outlets and stopped by Maidenform and other stores that sell corsets. I was looking for something plain, since it was going to be covered in feathers, something with boning to help hold its shape and something cheap! In the end, I found the perfect fitting corset fro my peacock costume for only $10.00! Such a great buy! Also, found a pair of High Waisted briefs from H&M for $10. I bought a size larger than I normally wear so it wasn’t too tight, nothing like trying to take off a pair like spanx without squishing the fabirc! Taking them on and off after they are covered in feathers is a bit of a pain if they are too tight! (I learned the hard way). 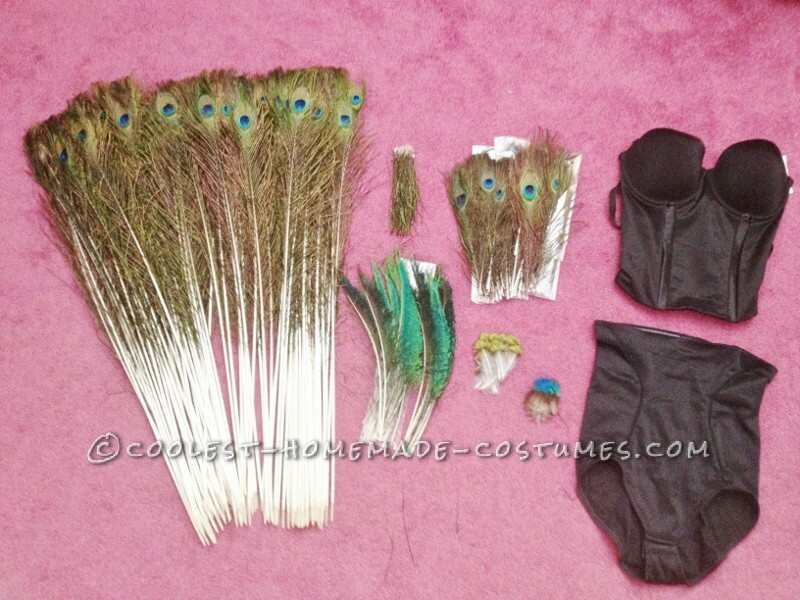 Once I had the corset, the undies and the feathers I was ready to start gluing. 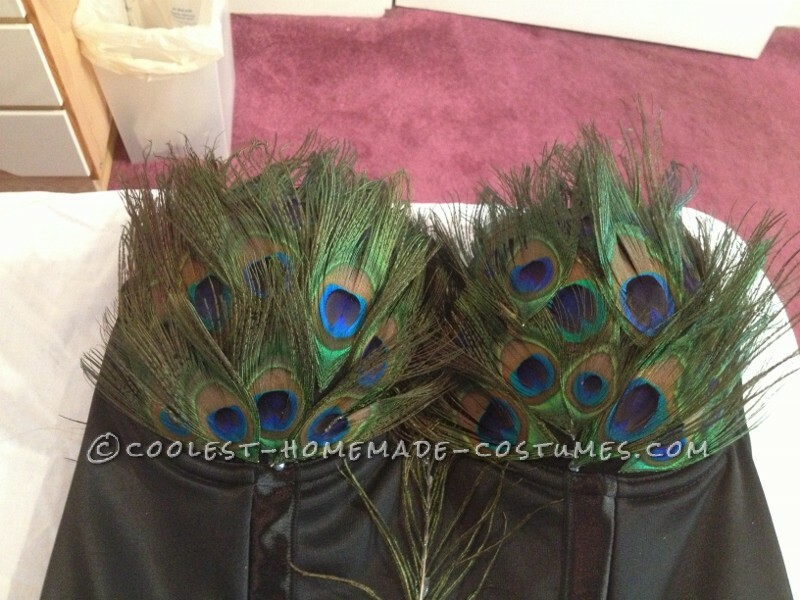 I started with the peacock costume corset, cut off the eyes of the feathers and just started to glue. Then, I bought some extra peacock costume feathers called swords and other small feathers but really didn’t use them much. 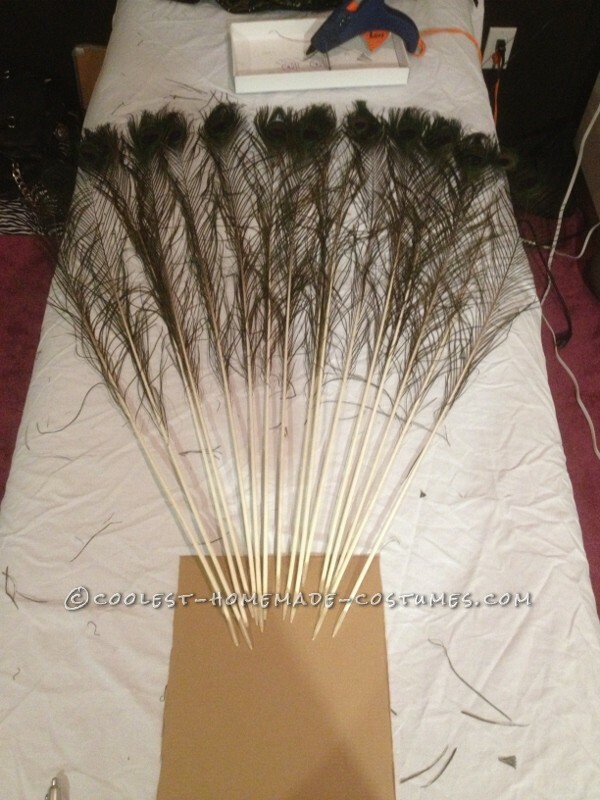 I decided to stick with the 10” feathers and just cut off the eyes from the stems. I glued them in a line across each part of the corset, the front and then two sides and after I was done I added feathers where I could still see the black of the corset. For the undies, I will skip the part about the trial and error, well maybe not, it’s quite comical. I bought my first pair of undies that were basically like high waisted spanx that had clips on the bottom by the crotch (thought this would be a great idea for using the bathroom all night). I glued feathers on them, tried them on to make sure they looked good before I went further and then tried to take them off without ruining the feathers. They fit so well to my body that I couldn’t squeeze out of them without bending or crunching the fabric which would ruin all the feathers! Needless to say, I had to wake my sister up at 1:00am to pull them off over my head! She was not happy but I couldn’t stop laughing! Anyway, I put on my new pair of high waisted undies on with the corset top. I marked with safety clips how high I would need to add the feathers. This way I wouldn’t waste feathers on areas that would be covered by the corset and also to make sure I wasn’t missing any area with feathers. More trial and error led me to realize I needed the undies to be stretched out when I glued the feathers on rather than laying down flat otherwise once you put them on the feathers will pull in each direction and come off. I made a fake mannequin out of a pair of stuffed jeans! I stuffed them with work out clothes, and tied the legs off in knots. It looked a little creepy but served its purpose. 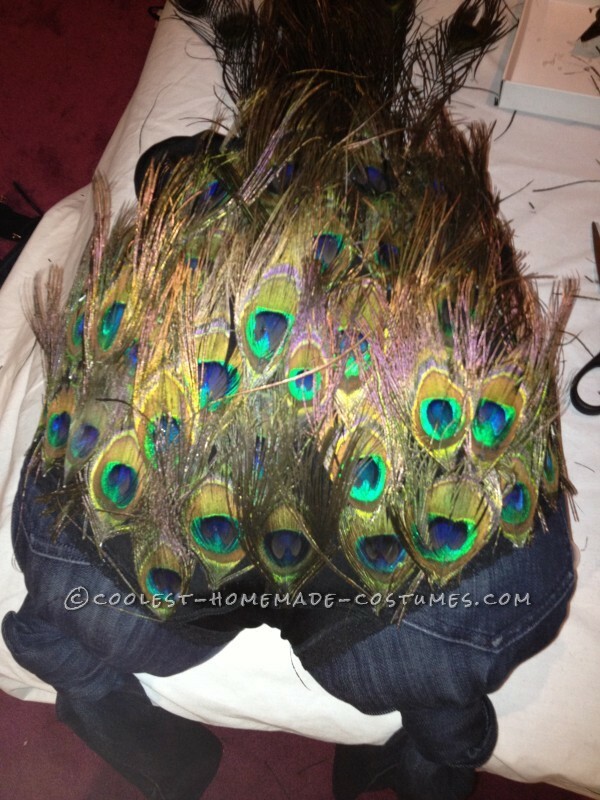 I then glued on the feathers all over the bottoms while it was on the fake mannequin. 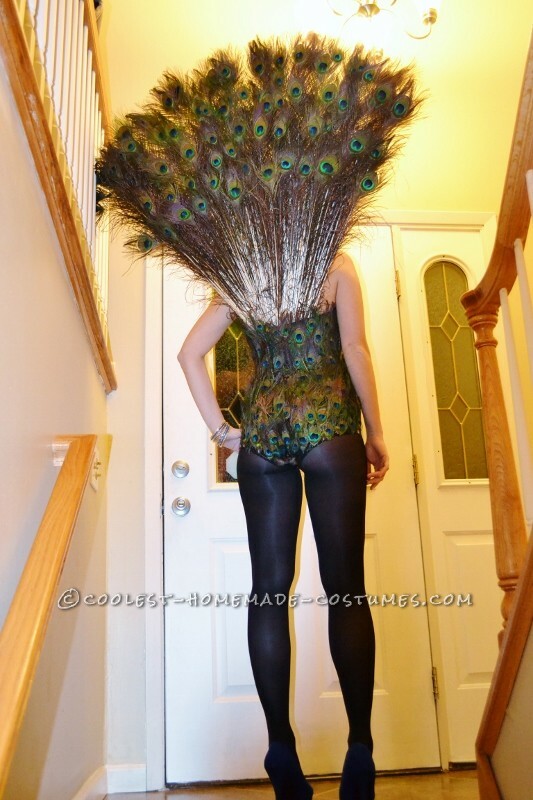 Now for the real eye popping part of this peacock costume, the tail. For this I used a piece of cardboard and a about 160 35” tail feathers. I cut a rectangle piece of cardboard that fit in the back of my corset. Next I placed the feathers on the cardboard in a V shape as far as I wanted them to fan out. I started gluing! Then, I did the next row the same way but a little lower. I cut off the extra parts of the stem from the bottom so they would all be in that V shape on the cardboard. I did this for 4 layers on each side and then cut the left over cardboard to match the V shape of the feathers. With this peacock costume I wore a pair of 5 inch heels which made me 6’ 3 inches. The tail still towered over my head. I had to duck in and out of doorways but it was awesome. 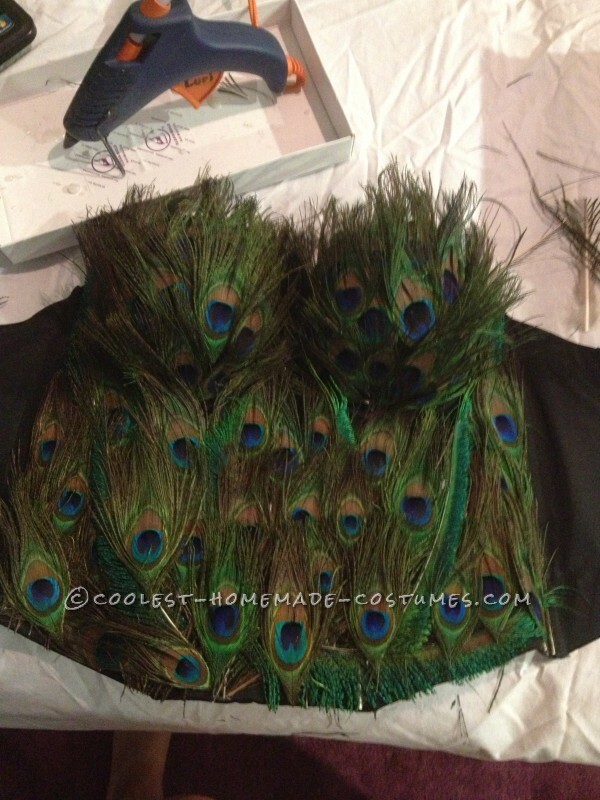 A LOT of hot glue was used in the process of making this peacock costume. I burned a few fingers tips over and over but it was totally worth it! 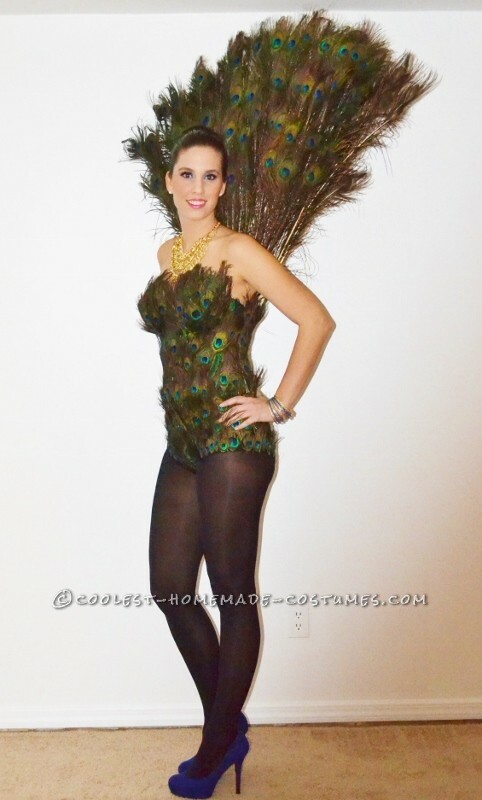 There are about 460 feathers on this costume and it cost a little over $100 to make. I had to fix a few here and there that got beat up from a night of partying but overall they held their own. Two tail feathers on the end of the fan broker off in the wind and only one feather came off the bottoms I think from sitting down. I was really surprised and really happy at how well the costume still looked after three nights of wearing it. 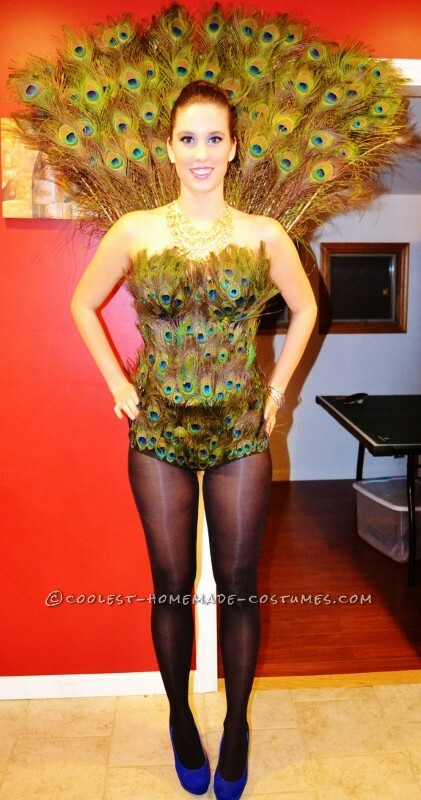 Everyone absolutely loved this peacock costume! I went out 3 different nights since Halloween fell on a Thursday this year. Each time I went out I had so many people compliment the peacock costume and take pictures of me or with me. Everyone asked where I got the costume and when I told them I made it they couldn’t believe it! It felt fantastic! I couldn’t have asked for better reactions from everyone. It also made me feel super accomplished I was able to make a costume everyone loved so much. 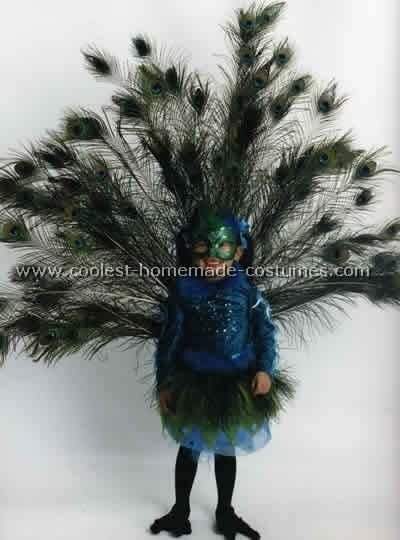 I love animal costumes and badly wanted my little three year old to be a beautiful peacock for Halloween. So, I created this super fun peacock costume. I bought feathers, about 100 real peacock feathers. Attached them with glue tape and staples to two sides of foil covered cardboard circles to create the back feathers. It was all hidden by the feathers as the construction part was on the inside of the 2 boards. 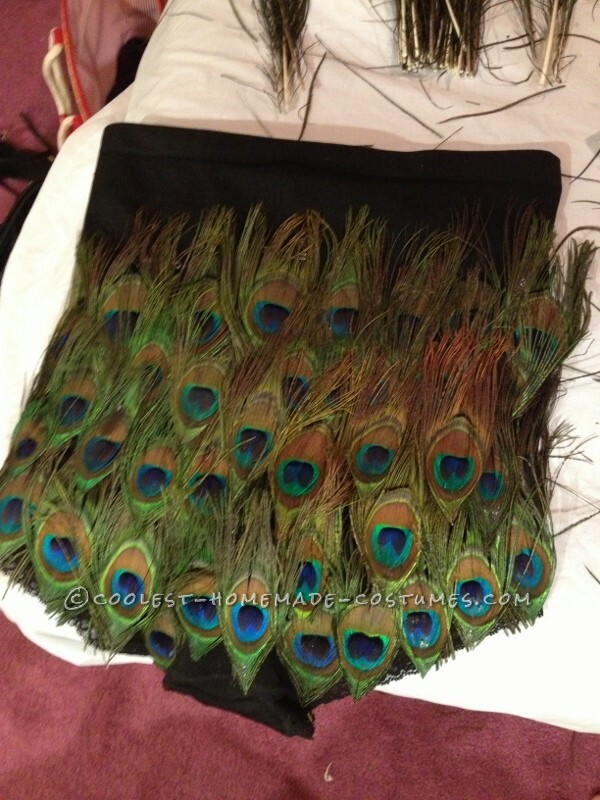 I attached straps (backpack style) to the back feathers. These straps slipped into the leaotard I made her out of teal velour. To the Leotard I added bling, sequins, etc. etc. plus did feather trim down the sleaves. I did a tutu and wrapped feather trim around that as well. Then for her feet I had her wear black tights, with gloves on her feet, stuffing the fingers with stuffing and folding some in. For her face she wore a mask I decorated with sequins and gems and feathers. She was beautiful and loved strutting around everywhere in her peacock costume. I wish I could do the same costume every year we loved it so much. Cool Homemade Star Trek Costume: Klingon Warrior!